Some parents dread the day their child falls in with the wrong crowd — the rebels, the dopers, the drop outs — but what happens when your daughter goes on tour with one of the world's biggest rock stars? Cornelia Tan, who works at Saskatoon's Pro Sport Rehab and Fitness, toured with Guns N' Roses across Canada as frontman Axl Rose's personal massage therapist. Next week, Tan joins the band again for a month-long tour in South America. "My dad had his concerns, for sure," said Tan. Tan's parents hadn't heard of Guns N' Roses, but once they Googled the band, revealing its notorious hard partying past, they had some questions. 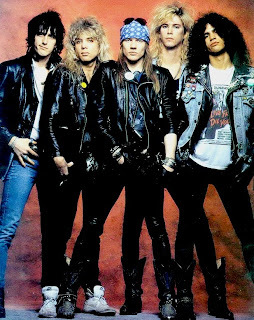 "This isn't the Guns N' Roses of the Appetite for Destruction days," said Clyde Bersky, Tan's boyfriend who joined her for the Canadian dates. "The fans are rowdier than the band." Tan, 33, has worked at Pro Sport, her first job out of school, for about two years. She's worked with several high-profile acts that have played Credit Union Centre, including The Eagles. On Jan. 19, she set up a massage table in a backstage room at CUC and waited for her latest client, Axl Rose. The 47-year-old singer/songwriter of Welcome to the Jungle, Sweet Child o' Mine and Paradise City is known for his physical performances — he ran and jumped across five stage platforms for almost three hours in Saskatoon. Eighteen years ago, Rose told Rolling Stone magazine he has chiropractors and massage therapists on call while touring. "I work with a massage therapist, because I put a lot of stress in my lower back, and with what I do onstage, there's a lot of rebuilding that has to be done," he told the magazine. Tan usually works with Rose before a concert. She said she has a style of massage therapy that works well for rehabilitation. "I'm strong and I treat with strength," she said. "I work at a slower pace, which allows me to work deep without causing pain." She travelled with the band to Regina, Toronto, Montreal, Halifax and Moncton. Next month she's off to the slightly more exotic cities of Bogota, Buenos Aires, Santiago, and San Paulo. Tan and her boyfriend of 2 1/2 years travelled like any member of the band: they slept on tour buses travelling between cities, stayed in posh hotels and were transported to concert venues by limo. The backstage rock-n-roll excess has been replaced by television and pancakes. Though Rose has been characterized as a moody, unpredictable artist, Tan said he's always been cordial with a great sense of humour. On the massage table, he's just another client with knotty shoulders. "(At first) I was excited, definitely curious about my client," said Tan. "But I had to approach the job as if he was any other client."